Nature never ceases to surprise its admirers and hence, it is also considered as a beauty beyond comprehension. It is rightly said that once you are on your way to some destination, you are meant to encounter the unseen magnificence and charm of nature in the form of its hidden marvels. 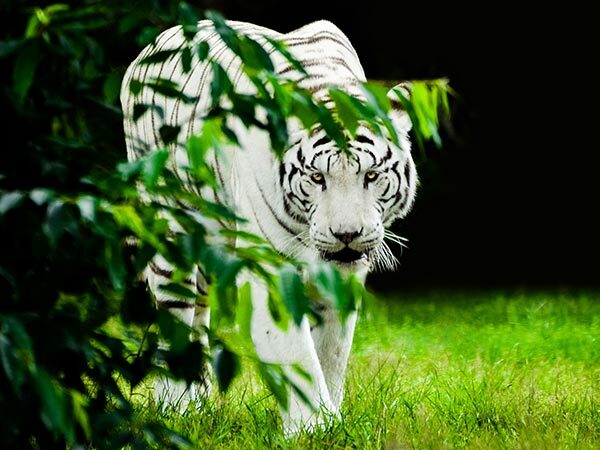 White tiger is one amongst these marvels of nature which are definitely commendable. Also called bleached tiger, the white tiger possesses a white fur and hence, it looks more alluring than tigers with reddish orange fur. This difference is beacuse of the absence of orange pigmentation. However, the beauty of white tigers is still captivating. Ever been a guest to this rare splendour of nature? If not, then you must visit the following places in India where you can certainly spot white tigers. Unarguably, Sundarbans is one of the richest areas in the world and hence, it is also known as one of the natural wonders of the world. Being the largest coastal area covered with mangrove forests, it is impossible for Sundarbans to not own the beauty of white tigers. Sundarbans National Park is a tiger reserve which houses numerous Bengal tigers. White tigers are also spotted in the dense woods of Sundarbans and therefore, it is the perfect place in West Bengal to witness the rarest of natural beauties. Spread over an area of 25 hectares and located at a distance of around 20 km from Rewa in Madhya Pradesh, Mukundpur Wildlife Sanctuary is the world's first white tiger sanctuary which is specially formed in order to protect the population of rare white tigers. It is said that the first ever white tiger in the world was captured in the region of Mukundpur by Martand Singh, the maharaja of Rewa, in the year 1951. However, since the last few decades, no one has spotted white tigers in and around the region. It is still believed by locals that the region is home to numerous white tigers. Bandhavgarh National Park is another protected area in Madhya Pradesh which has been home to several species of tigers since its formation. The Park is known for its high density of tigers in India and therefore, it is also an ideal place in Madhya Pradesh if you are looking to enjoy a tiger safari in its jungles. Apart from spotting diverse wildlife, one can also witness the beauty of white tigers here. Being a significant part of the Western Ghats, the region of Nilgiri Hills is assuredly one of the richest areas in India with diverse wildlife and rich biodiversity. The beauty of Nilgiri Hills has enhanced since the news of spotting white tigers within its boundaries spread. Even though it is not an easy task to capture the beauty of white tigers in Nilgiri Hills, it is still a place worth visiting due to the richness in all kinds of vegetation and wildlife. If you are lucky enough you can certainly spot these rare white tigers in Nilgiri Hills. Located in the beautiful state of Assam, Kaziranga National Park is immensely popular for nurturing the population of one-horned rhinoceros, which are present in abundance. Unknown to many, it is also home to certain species of tigers and has been protecting their population from hunting. The white tiger is one amongst these rare species which have been dwelling inside this national park. However, the presence of white tigers in Kaziranga National Park is still a mystery as it has been spotted very rarely according to locals living in and around the park. So, if you are looking forward to witnessing white tigers in Assam, Kaziranga National Park is the best and only option for you.